In the Catholic music world, Tom Booth is a modern legend and he has served as a mentor to several major stars, including Matt Maher. In the early 1990s, Booth wrote Mass settings and ritual music. Those arrangements, the “Mass of Life,” have been used across the country since 1993. Now that the new translation of the Roman Missal is being implemented next weekend, that means Booth’s long-used music is being shelved. Listen to him prepare the youths here. Booth was still emotional. He just helped guide the worship of nearly 25,000 people inside Lucas Oil Stadium with the settings that would be retired that night. 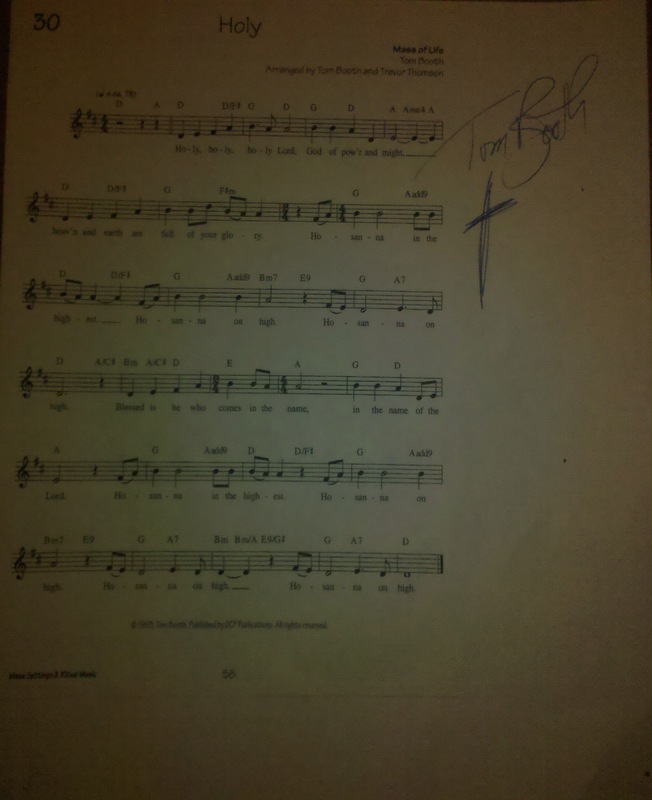 At that moment, Booth grabbed his sheet music, signed it and gave it to me. What’s happening in America next weekend is a huge deal. Many adjustments will have to be made. While we welcome what’s coming, let’s cherish what has been so important in attracting millions to the faith during the last few decades. I know I won’t forget Tom Booth anytime soon. I grew up with Tom, having been a Life Teen member starting WAY back in the mid-80’s when Life first started and while these changes are probably necessary, it saddens me to no end that Tom’s music, ”The Mass of Life”, will no longer be played at Mass…I actually cannot even picture it! So, Tom, thank you! Thank you for your beautiful words, thank you for your beautiful music and most of all, thank you for sharing your gift with us (And thanks to Tammy, for often putting gorgeous movement together for those songs). You have truly been an inspiration to me and my family and while we know YOU are not going away, it seems only appropriate – given these upcoming changes and the Thanksgiving holiday – to wholeheartedly share with you how grateful we all are to have had you come into our lives and bless us with you! Heidi – great to “hear” from you. 🙂 I am now thinking that, with the help of others, I should adapt the Mass of Life setting to the new Roman Missal. Not sure why I was resistant to that idea before. I have a couple of friends that have already been working on it and I have just not been sure. Anyway, an adaptation wouldn’t hurt. There are just SOOOOO many new settings out there. I didn’t want to add to the cacophony that these past two years have been with publishing and new mass settings. Your words were very heart-warming. I am glad you are well. We’re all family, and we all need to adapt whether we would have chosen the new translations or not. How we sort of bristle at change, and it would better serve us to welcome it. Tom, please let the love and your talent make the needed updates. You are a wonderful gift to us all, and with prayer and contemplation, I am sure you will be Holy Spirit inspired once again. And our hearts will be continued to be moved. Thank you for all you have shared and given. I feel blessed working with you in Life Teen at St. Timothy. We enjoyed your Paschal Mystery Tour too! Thanks for the sacrifices unique to your ministry. Former St. Tim’s parishoner and choir member w/ you and Matt and Tim & Julie; Tom, please modify the mass of life. I think the Amen is already done….so the hard part is over. Good Luck with it Tom.